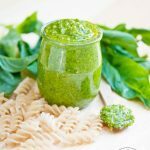 If you love pesto, this clean eating traditional pesto sauce should definitely be on your to-make list! I’m writing about this clean eating traditional pesto sauce recipe from an amtrak train on my way to Old Sacramento for the weekend. The scenery is ever changing and switches from wide open fields to old shanties, farm houses and small towns that give the impression that only 5 people live there. I love the open green fields and all the clouds, even in their currently gray state promising to rain down on us at any second. The speckled cows and white sheep are grazing, and the trees are few and far between. Occasionally, we pass a set of new houses that look odd in the middle of all this farm land. Almost like a polished, sparkly celebrity trying to fit in at the local dairy. Oddly out of place, but still part of the landscape. The old church buildings make me want to plan a small country wedding, and the large warehouses remind me that industry is never far away from peaceful landscapes and a slower pace of life. And with all of that scenery blowing by at close to the speed of the winds fighting against the train, all I can think about is the dinner I’m making tonight, and how I really can’t wait to get home. 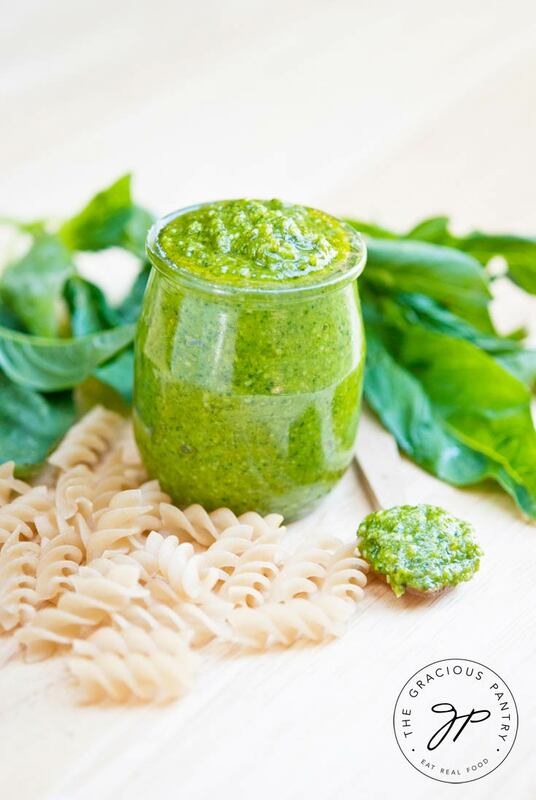 Even Mini Chef said this clean eating traditional pesto sauce recipe is one of my best. So with that in mind, here is my recipe. And remember, a little goes a long way. Keep that in mind when adding this to any dish. The homemade stuff always flavors foods far more than the store bought stuff. At least that’s been my experience. And proceed with caution because this stuff can become addictive very, very quickly. This classic pesto sauce is fill with amazing flavor and is totally easy to make. Place all ingredients in a blender or food processor and blend until you have a nice, smooth pesto sauce. SS – Thanks! Hope you enjoy it! Abes1luv – Almond, cashews or walnuts work great as well. But you really can’t taste the pine nuts in this. Promise. Chellie – Yes! Pesto always freezes well. Thanks for the reminder! Unfortunately, there was none left over to freeze! Haha! Taylor – It would make a fabulous sauce for pizza! I wouldn’t keep this any longer than a week in the fridge, but it freezes really well. Freeze in ice cube trays if you have a lot left over. makes it easy to portion out as needed. Melody – I don’t know that I would enjoy the flavor very much. But perhaps other herbs would be good? Not sure. I’ll have to experiment. Meg – Pesto is pretty versatile. While I would stay away from the peanuts due to the strong flavor they impart, you could certainly use almonds. Though you may get a better texture if you use almond butter. Chelsea – You could try blending some cottage cheese until smooth and then adding it to that. But if you warm it, warm it slowly or it will separate and look like curdled milk. What is the shelf life on this pesto? Brandy – In the fridge, probably a two weeks. You’ll smell the difference when it starts to change. Amy – The pine nuts are for both flavor and texture. But you can certainly try it without. OK great! Is there something I could substitute for the pine nuts? Amy – Walnuts or cashews work pretty well. Tracy – The best thing you can do is freeze it in ice cube trays. This gives you individual portions you can easily grab out of the freezer for cooking when you need it. I absolutely love this pesto recipe but I wonder how you get 2 1/4 cups of pesto out of it. Maybe I’m measuring wrong but it usually only makes 1c of pesto for me. If your not a garlic lover I’d suggest reducing the garlic in this. Carol – It could just be differences in how we are measuring. My yield is pretty consistent every time I make it. Glad you like it though! !